Arlene Harjo’s two-year-old silver Nissan Versa sat over two hundred days in an impound lot in Albuquerque—targeted by city officials for civil forfeiture. Nobody ever claimed Arlene violated the law. Instead, the city tried to take her car because her son, Tino, allegedly drove drunk. Arlene does not approve of drunk driving; if Tino broke the law, she agrees he should be punished. But she does not see why she should be the one to lose her car. In Albuquerque, these kinds of property seizures are big business. The city’s forfeiture program brings in over $1 million every year. Between 2010 and 2014, Albuquerque seized over 8,300 cars—approximately one car for every 66 residents of the city. Police and prosecutors take all this property on the theory that property can be “guilty” of an offense if it is used during a crime, even if the crime was committed by somebody other than the property owner. Property taken through civil forfeiture is then used to pay the salaries of the very people doing the taking. All this was supposed to end in 2015, when New Mexico’s legislature passed landmark reforms abolishing civil forfeiture. Under the reforms, government can only take property if the owner is criminally convicted, and police and prosecutors can no longer keep the money that they seize. But, as Arlene’s experience vividly demonstrates, officials in Albuquerque are refusing to follow the law. Albuquerque’s program is not just contrary to the state’s reform law, it’s also deeply unconstitutional. Civil forfeiture gives police and prosecutors a perverse financial incentive to take property from people who have done nothing wrong. Arlene joined with the Institute for Justice to enforce New Mexico’s landmark forfeiture reforms and to bring Albuquerque’s unconstitutional program to an end. In December 2016, city officials agreed to give back Arlene’s car. The case continues, however, as Arlene continues to press her legal challenge to the city’s program. Arlene sued to get her car back, but she is also suing to achieve a broader goal: If this lawsuit succeeds, civil forfeiture in New Mexico will be abolished once and for all. In March 2018, the court issued a decision agreeing that Albuquerque’s program violates state law. Then, in July 2018, the court issued a decision holding the program unconstitutional on the ground that the city unlawfully uses forfeiture revenue to fund the forfeiture program and unlawfully places the burden on property owners to prove their own innocence. In 2015, New Mexico’s legislature enacted landmark reforms abolishing civil forfeiture throughout the state. But the City of Albuquerque has a million reasons not to follow the law. The city operates a civil forfeiture program that brings in over $1 million in revenue every year. Arlene Harjo is a resident of Albuquerque who became caught in that forfeiture program. In open defiance of the 2015 reforms, the City of Albuquerque tried to take her car using civil forfeiture. If successful, the city would have sold her car at auction and the very city officials who worked to take the car would have kept the proceeds to pad their budget and even to pay their salaries. Arlene joined with the Institute for Justice to get back her car and shut down the city’s illegal and unconstitutional civil forfeiture program once and for all. The City ultimately agreed to return Arlene’s car, but Arlene’s fight to shut down the program still continues. Arlene Harjo entered the world of civil forfeiture in April 2016, when her son, Tino, was arrested while driving her two-year-old Nissan Versa. According to Albuquerque police, Tino was driving drunk. Arlene did nothing wrong. But under civil forfeiture, the city can take Arlene’s car on the theory that the car itself is “guilty” of being used in a crime. Arlene has spoken many times with Tino about the importance of not drinking and driving. Tino has a history: He was arrested for driving drunk in 2009, seven years ago, and he has two earlier convictions from 1998 and 2001. Arlene emphasized to Tino that he could never make that mistake again, and he repeatedly told her he understood. A lot has changed in Tino’s life since he was arrested in 2009. He earned a technical degree in Electrical Engineering in 2011, he bought a house in 2012, and in 2013 he became a father to a little boy. He also separated from his longtime girlfriend, moved back in with his mom, and in 2013 began occasionally borrowing his mom’s car after his own broke down. After years without any kind of problem with drunk driving, Arlene believed Tino could be trusted. Still, though, she only let Tino borrow her car for short trips. He always had to ask her permission, and he always had to tell her where he was going. Tino borrowed the car to run errands, to go to the gym, and to visit his son. Tino borrowed Arlene’s car hundreds of times without incident. But then, on April 23, 2016, Tino abused his mother’s trust. He asked Arlene if he could borrow the car for a short trip to the gym, but instead he took a day-long drive to visit a girlfriend who had recently moved to Texas. If Tino had told the truth about where he was going, Arlene never would have let him take the car. When Tino failed to return as expected, Arlene became concerned. She spoke to a friend of Tino’s, who told her where Tino had gone, but still she worried when Tino failed to come back at night. Arlene was up late waiting for her son, and when she went to sleep he still had not returned. Finally, the next morning, Tino called to say that he had been arrested for driving drunk. Not long after, the City of Albuquerque sent Arlene a letter: Because Tino had been arrested while driving Arlene’s car, the city was taking it away using civil forfeiture. To try to get back her car, Arlene was forced to venture inside Albuquerque’s forfeiture machine. Run from a seventh-floor office in a nondescript office building, the city’s vehicle forfeiture program churns through more than one thousand cases every year. In 2014, the program seized 1,272 cars and earned more than $1.2 million. Between 2010 and 2014, the program seized over 8,300 cars—approximately one car for every 66 residents of the city. Shockingly, Albuquerque plans for these forfeiture revenues in its annual budget. The City’s 2016 budget, for instance, includes as a “performance measure” for the upcoming year a target to conduct 1,200 vehicle seizure hearings, to release 350 vehicles under agreements with property owners, to temporarily immobilize 600 vehicles, and to sell 625 vehicles at auction. Meanwhile, city officials enjoy the ability to take seized cars out for a ride. In 2014, reports surfaced that employees of the forfeiture program were using cars from the impound lot for personal trips and even their daily commutes. In the topsy-turvy world of civil forfeiture, Arlene was now required to prove her own innocence to get back her car. Worse, Arlene was required to prove her innocence to Albuquerque’s Chief Hearing Officer, Stanley Harada, a supposedly impartial judge who was apparently uninterested in anything she had to say. Harada’s decision at the end of an administrative hearing is not the end of the road; the city must go to court to make the forfeiture final. But most property owners cannot afford to keep fighting, and instead agree to “settle” on terms set by the city. In Arlene’s case, the city offered to drop the forfeiture case and return the car if she paid $4,000 and agreed to immobilize the car for 18 months. Arlene did not think she should have to pay anything, as she did nothing wrong, and so she continued to fight. Arlene is hardly the only innocent person to get caught in Albuquerque’s forfeiture machine. To the contrary, Harada told the Albuquerque Journal that in about half of all cases, the alleged offense was committed by someone other than the property owner. An article in the Journal reported several of these stories. Claudeen Crank, for instance, had her car seized after she left it with a mechanic and a complete stranger took the car on a drunken joy ride. Because the cost to fight the forfeiture would have been greater than the value of the car, Claudeen had no real choice other than to sign ownership over to the city. The same article in the Journal reported other, similar cases. Marcial Gonzales was forced to agree to pay $850 and have his car immobilized for 30 days to settle a forfeiture action after he allowed a friend to drive the car—not knowing that the friend had a suspended license. Similarly, Jose Chavez, Jr. lost his car when his friend’s aunt asked to borrow it to pick up her grandchildren; Jose told the Journal he had no idea her license had been revoked. Civil forfeiture leapt to the attention of New Mexicans in late 2014, when the Institute for Justice unearthed video of Las Cruces City Attorney Harry “Pete” Connelly speaking at an annual conference where New Mexico city attorneys gather to discuss their forfeiture programs. Albuquerque’s Chief Hearing Officer Stanley Harada spoke as well, as mentioned above, but Connelly spoke in particularly colorful terms. When the New York Times reported about Connelly’s remarks, the story generated public outrage. New Mexico’s legislators were spurred to action and—in an unusual display of bipartisan unity—unanimously enacted a law to abolish civil forfeiture. New Mexico’s forfeiture laws now provide the strongest protections for property owners of any state in the country. 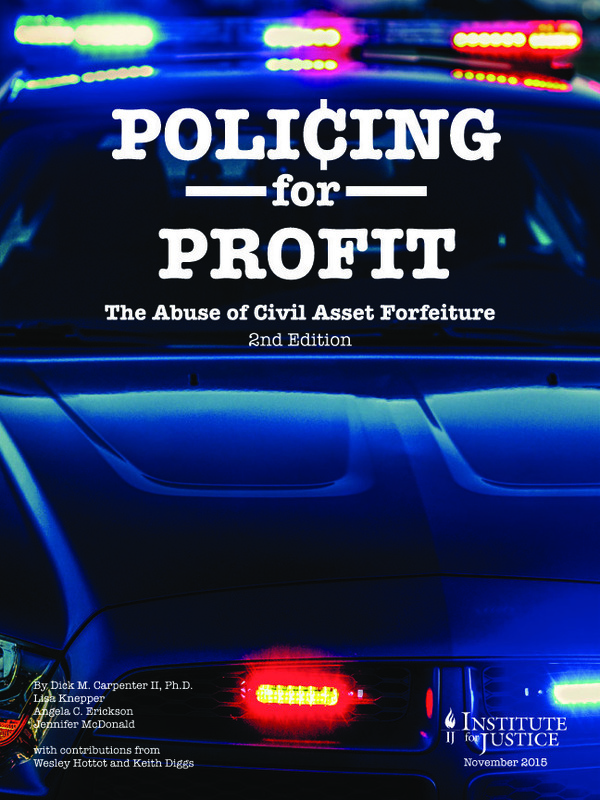 Policing for Profit, a report issued by the Institute for Justice, rates civil forfeiture laws nationwide. While New Mexico earned a D- before the reforms, today New Mexico’s forfeiture laws earn an A-.5 No other state scores such high marks. Yet, as Arlene’s case vividly demonstrates, Albuquerque officials have responded to reform with defiance. Indeed, Albuquerque is so unbowed that it has announced plans to buy a new, bigger parking lot to store all the cars it plans to seize—a parking lot that will be paid for using forfeiture proceeds. Arlene went to court to get back her car, but also to advance a broader goal: In addition to opposing the city’s attempt to forfeit her car, Arlene asked the court to put an end to Albuquerque’s forfeiture machine. As a city in New Mexico, Albuquerque is subject to these reforms. The New Mexico Constitution allows Albuquerque to enact its own ordinances, but only if those ordinances are consistent with state law.8 Where the State Legislature issues one command, and a municipality refuses to follow it, state law controls. Here there is just such a conflict. New Mexico’s reforms abolished civil forfeiture, and yet Albuquerque continues to take cars using civil forfeiture without having to convict anyone of a crime. Albuquerque’s program is not just contrary to state law, it is also unconstitutional. Civil forfeiture creates a perverse and unconstitutional financial incentive for police and prosecutors to pursue forfeitures, even in marginal cases, in order to fund their budgets. Albuquerque’s civil-forfeiture program is a recipe for biased and self-interested decisionmaking: Under the city’s forfeiture ordinance, police and prosecutors get to keep all the money earned forfeiting cars. Fully half of that revenue goes to pay the salaries of the city officials running the forfeiture program. For those officials, forfeiture is more than a matter of enforcing the law; it is how they make sure they get paid. This has to end; the people who enforce the law should not benefit financially from taking private property. Arlene is therefore also raising a constitutional challenge to Albuquerque’s program, alongside her claim under New Mexico’s forfeiture reforms. The implications of this litigation extend well beyond Albuquerque. Other jurisdictions across New Mexico also operate vehicle forfeiture programs, including Santa Fe, Las Cruces, Rio Rancho, Doña Ana County, and Bernalillo County. If Albuquerque’s program is struck down, these other programs will follow. At the national level, meanwhile, New Mexico’s forfeiture reforms have set a guiding example for the rest of the country. Precisely because New Mexico’s reforms serve as a beacon for other states, it is vitally important to see those reforms fully implemented. Following the hearing before Albuquerque’s Chief Hearing Officer Stanley Harada, the city filed a case in New Mexico’s Second Judicial District Court to finalize the forfeiture. The city is the plaintiff, and the car is the defendant. This case is therefore captioned City of Albuquerque v. One 2014 Nissan 4DR Silver. As the property’s owner, Arlene entered the forfeiture lawsuit as a “claimant” to prove her innocence and get her property back. In addition to contesting the forfeiture, Arlene also asked the court to enter an order shutting down Albuquerque’s entire forfeiture program. Although the city has now returned Arlene’s car, she continues to pursue that broader claim. In addition, Arlene filed a lawsuit seeking an award of $1 in nominal damages, as well as for a small sum to pay for damage to the car in the time it was in the City’s seizure lot. Arlene filed that case, Harjo v. City of Albuquerque, in state court, but the city removed it to federal court. That lawsuit also continues to move forward. The Institute for Justice attorneys representing Arlene are Robert Everett Johnson and Robert Frommer, who litigate economic liberty and property rights cases nationwide. They are joined as local counsel by Asher Kashanian, a New Mexico attorney.